Popular This Week: Internal Audit Department Key Performance Indicators (KPIs) and more! This week, we are highlighting the Top 5 Pages on KnowledgeLeader from November 12-16! Take a look at the "best of the best" of our tools that could help you simplify your audit projects. 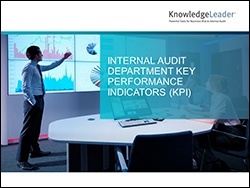 This tool outlines key performance metrics that are used for assessing audit functions, the outcome measures associated with each metric, and the activity measures that drive each outcome metric. This sample audit report outlines findings from a risk assessment performed at a company with the purpose of identifying areas of risk and developing a three-year internal audit plan. This audit report summarizes a strategic and operational review of a company’s business environment and production processes. The objectives of the review are as follows: obtain an understanding of a company’s business environment and strategic processes, evaluate the internal control environment and the effectiveness and efficiency of the processes, and identify opportunities for internal control and process improvements. The objective of this audit report is to reduce volume of controls to focus on key risks and associated controls, improve consistency of controls across application, infrastructure and IT processes, and clarify control ownership as needed. This report includes a process overview, risk review, criteria for control changes, key control review, key IT risks, summary of rationalized risks, reduction of controls by risk, a list of control by risk and next steps.